Hotels Capitola California, Capitola Hotel Lodging. The Quality Inn & Suites® Capitola By the Sea hotel in Capitola lets you relax and focus on the people and experiences you came for. We're conveniently located near endless beaches, lush Santa Cruz mountains and Pleasure Point. You’ll find plenty of other local sites, activities and attractions to explore near our hotel in Capitola like Seacliff State Beach, Mystery Spot, Monterey Bay Aquarium, University of California Santa Cruz, Santa Cruz Beach Boardwalk. Our Value Qs deliver professional, responsive and friendly service, as well as amenities that give you more for your hard-earned money such as Free hot, fresh and healthy breakfast, Free WiFi, Seasonal outdoor pool, Business center, Free weekday newspaper. Each smoke-free guest room offers a refreshing shower, coffee maker, desk, refrigerator, microwave and hair dryer, along with an iron and ironing board. Your Q Bed features a comfortable, premium mattress and linens, a generous supply of fluffy pillows and a soft, plush blanket—because we know how much you value a good night’s sleep. Select rooms come with balconies and fireplaces. Get your money’s worth at the Quality Inn & Suites Capitola By the Sea. 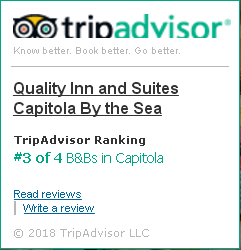 Capitola hotels like ours offer the best hotel rates and the best amenities, so you can focus on the people and travel memories that really matter. Book today! 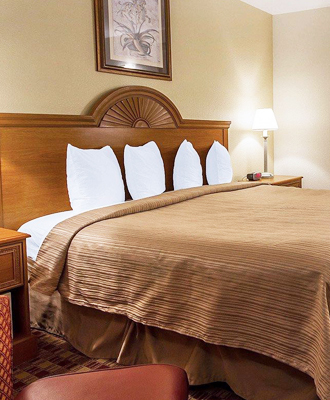 Experience a new level of comfort and luxury when you book a Quality Inn Capitola, CA. Our exceptional location and outstanding staff will make your stay memorable. The Santa Cruz Beach Boardwalk is recognized as the best seaside park in the world. Providing amusement thrills and family fun for over a century, the admission free boardwalk is quintessential California—renowned for its exciting rides, remarkable history, unique beach setting, and friendly attitude.